Casa Buena Vista is a charming semi detached surprisingly large Spanish style property, situated in the heart of Puente don Manuel. This property is close to all village amenities including bars, restaurants, shops, supermarkets and much more. Built in 1965 with a build size of 120m2 and a plot size of 200m2. 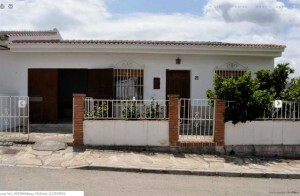 It comprises four bedrooms, one bathroom, a lounge diner, utility room and kitchen plus a garage, Casa Buena Vista is a traditional Spanish property with lots of Spanish character in a urban area connected to all mains water and electric services. It is ready to move into or with a little rearranging of the internal areas it would be a fantastic investment. The land to the side elevation of the property is actually 2 building plots we have just listed at 34000€ and the corner plot at 39000€ There is a front terrace and a courtyard at the back, This area is very convenient for the coast and Malaga airport and with every amenity on the doorstep it is very rare to find a property at this price. Come and buy it quickly - it will not be on the market for long.